Refeeding is the process of reintroducing food to people who are starved, malnourished or metabolically stressed due to severe illness. Refeeding syndrome is an adverse response by your body that occurs with refeeding. It’s a serious and potentially fatal condition that involves sudden shifts in your body’s fluid and electrolyte balance. This article explains the causes, symptoms and risk factors of refeeding syndrome, as well as information on how it’s typically treated. Despite having no universally accepted definition, refeeding syndrome is typically characterized by dangerous shift in fluids and electrolytes that occurs when a person who is malnourished begins to eat again (1). It can occur whether a person receives nutrition orally, enterally or parenterally. The syndrome can occur with the reintroduction of carbohydrates (2). Starvation causes a number of physiological changes that shifts your body from using carbohydrates as its main source of energy to using fat and protein. This absence of calories — more specifically carbohydrates — decreases your body’s secretion of insulin, the hormone that lowers blood glucose levels. The reintroduction of calories — and carbohydrates — stimulates a large increase in your body’s insulin production. Consequently, this increase in insulin secretion results in increased cellular uptake of glucose and electrolytes including phosphate, magnesium and potassium (3). The sudden introduction of carbohydrates can also reduce water and sodium excretion, causing fluid overload and heart failure. Hypophosphataemia — a deficiency of phosphate in the blood — is one of the predominant features of the refeeding syndrome. Hypophosphataemia itself, however, is not indicative of refeeding syndrome. Other hallmarks of refeeding syndrome include hypomagnesemia and hypokalemia, or a deficiency of magnesium and potassium. A person may also have several vitamin deficiencies, especially thiamine (vitamin B1), owing to its importance in carbohydrate metabolism. Malnutrition is the greatest risk factor of refeeding syndrome (2). In one study, nearly 75% of hospitalized older adult with malnutrition demonstrated a significant risk of the syndrome (5). But refeeding syndrome can occur in anyone where nutrition support (enteral or parenteral nutrition) is started after a period of decreased intake. According to the National Institute for Health and Care Excellence (NICE) people who meet the following criteria should be considered at risk of refeeding syndrome (6). A thorough nutrition assessment from a registered dietitian can determine risk by obtaining information on recent weight change over time, nutrition and alcohol intake, as well as any social or physiological problems. 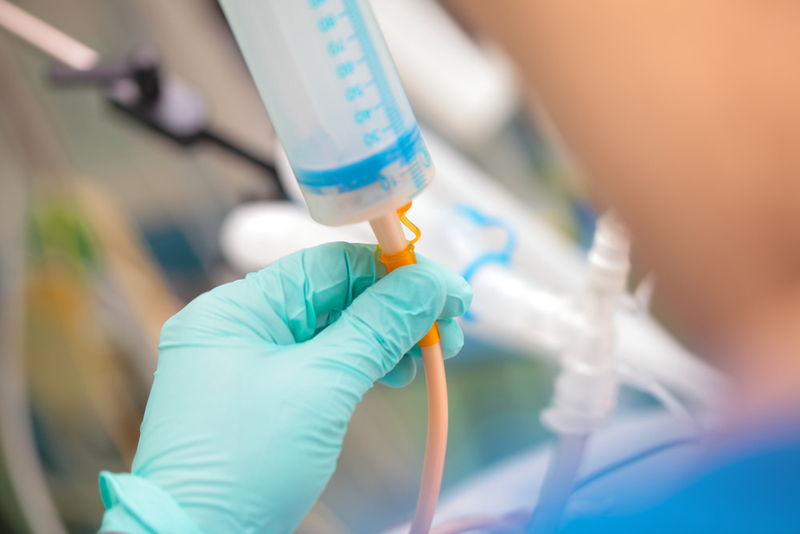 The multidisciplinary team, including a physician, registered dietitian, nurse and other allied health care professionals, should be involved in the care of someone with — or at risk of — refeeding syndrome. Treatment typically involves monitoring the heart, replacing the electrolytes and slowing down the refeeding process. Thiamine, a multivitamin and multimineral, as well as phosphate supplement may also be prescribed. Whether replacing the electrolytes should occur before refeeding or if they should occur in tandem remains contentious. The NICE guidelines recommend replacing and electrolytes and feeding at the same time to correct malnutrition sooner (6). In either case, feeding must be initiated slowly and increased gradually over the course of several days. Like with most conditions or diseases, however, preventing refeeding syndrome is preferable to treating it. By recognizing who are potentiality at risk, health care workers can best develop a plan to prevent refeeding syndrome. This may involve regular monitoring of weight, lab values, fluid balance and cardiac function, while making adjustments as necessary. The greatest risk is in the first four days of refeeding, but problems can still occur up to two weeks after. Refeeding syndrome is the severe — and potentially fatal — shift in your body’s electrolytes and fluids. It occurs with the initiation of nutrition after a period of poor intake or starvation, especially in those who are malnourished. The syndrome can lead to many complications including heart failure, confusion and paralysis. Treatment typically involves replacing electrolytes and other important nutrients, and slowing down the refeeding process. The interdisciplinary should be able to identify at-risk people and develop an appropriate plan to help prevent refeeding syndrome.